The argument that George Haikalis made in the New Your Times on May 8th, regarding the closure of LaGuardia Airport is completely misguided. The interesting and understandable way that anyone makes his or her case is by emphasizing their beliefs and downplaying the facts that don’t support their arguments. In the New York Times piece, Mr Haikalis makes that point that Newark and JFK airports could pick up the slack by the loss of LGA. He also makes the point that other local airports like Islip and Stewart could also handle some of the traffic lost to the closure of LGA. He completes his article by stating that the land occupied by LGA could be better used for affordable housing. This point isn’t worthy of discussion. What Mr. Haikalis doesn’t spend much time discussing are the enplanements(the actual number of people boarding flights). He simply glosses over the 30 million passengers that fly out of LGA each year and that makes LGA the 20th busiest airport in the United States. JFK is 6th busiest and Newark International, the 13th busiest. That means that LGA is busier than the busiest airports in the vast majority of states in this country. You simply can’t divvy up 30 million passengers as if it’s a simple task. That most important fact is simply not addressed. LGA serves a very important function in the New York Metropolitan area. While it’s true it serves many smaller aircraft because of the shorter runways, (nothing larger than a 757), it serves many of the smaller cities to which JFK and Newark either don’t fly or don’t fly with regularity. In addition, Newark and JFK are essentially international hubs. The majority of their flights leave in the late afternoon and evening. Anyone who has every flown to Europe would understand that it’s not uncommon to be the 14th or 15th plane in line for takeoff which easily translates to 1/2 hour or longer on the runway. If even ten more flights were added, there would be complete gridlock. Most importantly however is that LGA is really the only “municipal” airport despite the fact that JFK is also in Queens. LGA’s proximity to Manhattan makes it very attractive to business travelers. Taking a taxi to Manhattan using the Belt Parkway which is unavoidable, can be quite an unpleasant experience, not to mention time-consuming. 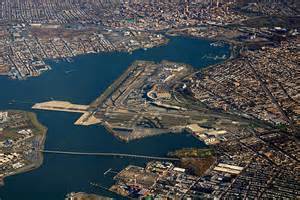 If the New York City economy is to continue to thrive and grow, then the rejuvenation of LGA cannot be compromised. Our Airports are the life blood of the city whether it be for business travelers or the millions of tourists who visit New York each year. I certainly look forward to the new development at LGA as it has been a long time in coming. Delta’s commitment to New York and to LGA specifically, demonstrates that it too appreciates the importance of this small but potentially dynamic airport. So to Mr. Biden I say yes, LGA needs help but help has already started and will continue until the vision of the New LGA is realized.